Enjoy the ultimate backcountry trip where few folks ever get to experience a place like this! Sky-piercing mountains stretch out across the landscape, their peaks crusted with ice and snow. The air is cool and fresh, and best of all, there’s an almost zen-like quiet out here. This is just another day on the trail when you go on this horseback adventure in the unspoiled wilderness of Banff. You will be accommodated at Sundance Lodge for two nights and at Halfway Lodge for three nights. Please note that prices are based on two guests per room, but the rooms have a variety of configurations. Sundance Lodge is a rustic 10-room log cabin that was built in 1991. Set against the looming Sundance Mountain Range and surrounded by thick woods, Sundance Lodge feels remote and secluded despite being just 16 kilometers (10 miles) from town. The lodge is powered by solar and heated by burning wood and there are indoor washrooms and heated showers onsite. Set at the base of Allenby Pass, Halfway Lodge is a rustic cabin with propane lanterns, candles, and a woodstove to heat the cozy kitchen, dining, and living areas. There are two shared outhouses and an outdoor shower onsite. Set at the base of Allenby Pass, weary riders have been resting their heads at Halfway Lodge since the 1920s. It’s been the setting for countless tales of wilderness adventures and one unbelievable story about a bear that literally dropped in for visit. During the trip, you’ll pass by the shimmering waters of the Bow River, travel along a historic pack trail and then ride up Allenby Pass where jagged rock formations line the route. Although you do climb to an elevation of 8,100 feet on this trip, the terrain is gentle for the entire way. And for all the rugged scenery, you’ll get to gaze at on this trek, the adventure itself is far from ‘roughing it’. Unwind in rustic luxury at the spacious Sundance Lodge and later at the cozy Halfway Lodge, both are quintessential mountain cabins. Comfortable beds, a crackling fire and some of the most delicious backcountry cuisine you’ll ever try can be found at these lodges. The six-day tour commences at 09:30 at the Warner Stables on Thursdays and Sundays with five full days of riding (approximately five to six hours per day including leisurely breaks) and a rest day. The ride returns to the stables at 16:30 on the sixth day. You need to arrive at 09:30 on the morning of your tour. The meeting point is at the Warner Stables, the big red stables located at the end of Sundance Road in Banff. There is plenty of free parking at the site. No experience is necessary and if you’ve never been riding before, then Banff Trail Riders will be sure to pair you with the perfect horse so you can enjoy a comfortable ride. The guides will also provide a brief riding instruction prior to the ride. With about 300 horses in the stables, Banff Trail Riders is able to pinpoint the absolute perfect horse for any rider. That means if you’ve never been riding before, Banff Trail Riders will be sure to pair you with the most mild-mannered horse available so you can enjoy the experience. After all, Banff Trail Riders wants both seasoned horsemen and horsewomen as well as new riders to have the time of their lives. The adventure starts at 09:30 at Warner Stables where you can park your vehicle for free for the duration of the trip. You’ll meet your personable expert guides, fellow riders, and the horse that has been specifically chosen for you. Your horse will know just where to step even on the most precarious of trails, so you can trust them to get you where you are going. This six-day expedition gives you a chance to really unwind and relax into the rhythms of the Rockies. Leave your phone behind and escape from the constant ping of emails. It’s the perfect opportunity to clear and reset your mind. Don’t worry if you are a complete greenhorn. The trusty horses, knowledgeable staff, and talented cooks will ensure you are comfortable every step of the way. Things happen on “Western Time” here so you may not leave right on the dot and you’ll have time to get to know your horse and ask any questions. Once you have organized the gear and saddled up, you will begin the 10-mile journey to Sundance Lodge, following the rushing waters of the Bow River and Healy and Brewster Creeks. On the way, you’ll stop for a cowboy cook-out along the banks of the river, the perfect fuel to give you energy for a day on the trail. You’ll saunter into Sundance Lodge at around 16:30 where you will be greeted by the friendly lodge host and shown to your room where you can freshen up with a warm shower and settle in. Your lodge host will cater to your every need and make you feel welcome at the lodge like you are a guest in their home. This is no simple, basic lodge. You’ll be pampered in backcountry luxury, sleeping in a comfortable bed, and dining on gourmet cuisine whipped up by your talented host in the professional kitchen. You’ll be surrounded by the beautiful backcountry of Banff, yet you’ll still enjoy the luxuries of life. The adventure continues as you journey 9 miles southward to Halfway Lodge. The rugged peaks of the Sundance Range loom over the eastern horizon as you follow the winding historic Erling Strom Trail. You’ll be following in the footsteps that the early explorers of the Canadian Rockies took nearly a century ago. You’ll stop along the way for a picnic in the fresh air of an open mountain meadow. Tonight, you’ll stay at Halfway Lodge, located at the midway point between Banff and Assiniboine Mountain where weary riders have been stopping to rest since the 1920s. As you approach, you’ll notice the trees start to thin out and the mountains peeking up above the treeline all around you. It is tucked into a postcard-perfect setting with a striking cauldron of mountains all around it. This lodge was constructed by Erling Strom in the 1920s as a stopover spot for the guests lead on trips from Banff to Mount Assiniboine. With propane lanterns and candles providing lighting and a woodstove providing warmth, it hasn’t changed much in the last 80 years. The only big change occurred in 1967 when a second story was added, due to a bear making a surprise entrance through the roof. After a hearty breakfast, you can leave your belongings at the lodge and set off on another adventure. Today, you’ll make the thrilling climb up Allenby Pass on horseback, an elevation of 8,100 feet. For many, this is the highlight of the trip as you’ll get a breathtaking view of the jagged rock formations, the enormous amphitheater of mountains stretching out all around you. It’s mind-boggling to imagine that Allenby Pass was a seafloor million of years ago. If you look closely, you can still spot fossils of sea creatures visible among the rocks. At the end of the day, you’ll return to your familiar room at Halfway Lodge where you already feel comfortable just like at home. As the sun sets behind the mountains, you can sit back and relax, drink wine, and share stories and photos with your fellow adventurers. Today is a rest day at Halfway Lodge. An optional hike is available today to a shimmering glacial fed lake at the end of the valley where you can enjoy views of the valley below. But if you’d rather relax, there’s no pressure. This lodge is a lovely place to find some quiet time, far away from the pinging of notifications and the pressure of your endless to-do list. It’s a chance to take a breather, perhaps by sitting on the deck while getting lost in the pages of a good book. You may even take some time to groom your horse that has no doubt become your best friend by this point. You will say goodbye to the lovely staff at Halfway Lodge. It’s time to hit the winding trail along Brewster Creek back to Sundance Lodge. You won’t want to leave Halfway Lodge once you have experienced this gorgeous retreat in the Rockies. Your guide will lead you through the backcountry on a scenic and exciting trail, criss-crossing the valley in the historic footsteps of the early pioneers and stopping for lunch along the way. You’ll arrive back at Sundance Lodge again, a luxurious retreat you will have fallen deeply in love with. Pamper yourself after your ride with a warm shower and a glass of wine, then enjoy another delicious meal prepared by your professional chef lodge host. It’s your last morning at Sundance Lodge which by now will feel like home due to the warm hospitality of your host. Wake up in your comfortable bed one last time, gather around for a delicious breakfast, and wave goodbye as you begin the journey back to Banff. It’s your final day on the trail, a gentle 9-mile ride from Sundance back to Warner Stables. Your guide will lead you through the backcountry along winding river trails and through the thick pine forests with the jagged peaks of the Rockies always standing proudly on the horizon. You’ll stop along the banks of Healy Creek for a lunch of fresh sandwiches, baked goods and fruit. You’ll return at approximately 16:30 with plenty of great tales from the backcountry to tell your family and friends. This holiday will take place in Banff National Park in Alberta, Canada. During this holiday, you will be served fully catered meals including six breakfasts, six lunches, and five dinners. Even miles away from civilization, the backcountry chefs are able to prepare some surprisingly sophisticated meals. Large, well-equipped kitchens and talented cooks are the key to the great food at both Sundance Lodge and Halfway Lodge. You can savor everything from braised beef short ribs to Crème Brulee Cheesecake It’s rustic comfort food taken to a whole new level. 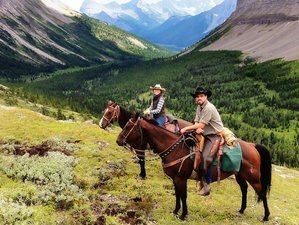 Banff Trail Riders offers horse riding holidays and adventures for an hour, a day, or a week in Banff National Park. This horse riding holiday is available from June to September 2019 with the arrival every Thursday and Sunday, please select an arrival date below.